Last November, I was in Whitby doing a little extra research for Death at the Seaside, the eighth Kate Shackleton novel, to be published as a paperback original on 6 October 2016. Whitby is a former whaling port, once home to Captain James Cook, eighteenth century explorer, navigator and cartographer. I climbed the 199 steps from the old town to the parish church of St Mary’s, where George III attended Sunday services during the time he was being treated nearby for his ‘madness’. 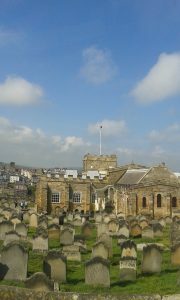 This is the churchyard that inspired Bram Stoker to write Dracula. Twice-yearly, the town hosts a hugely popular festival for Goths. There’s also a pirate festival. This took me by surprise on one of my visits as I saw first one person strolling about in pirate garb, then another and another. There’s a great atmosphere to the place. Visitors know how to make their own fun. 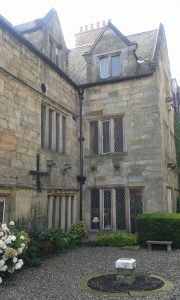 During my stay, Bagdale Hall Hotel became my temporary home. In 1927, the year of the story, Bagdale Hall is home to Kate’s friend, Alma. Kate, staying at the Royal Hotel, had hoped for a relaxing holiday. A mysterious death, and the discovery that Alma’s daughter Felicity has disappeared, lead Kate to set aside her plans to walk the cliffs and stroll along the shore. 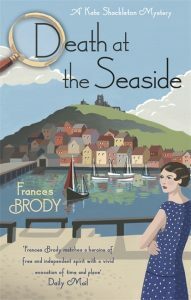 She investigates, assisted by Jim Sykes, who is holidaying in nearby Robin Hood’s Bay, and Mrs Sugden who had been staying in Scarborough. On the eve of her sixteenth birthday, Felicity Turner made a plan. From then on, everything fed into The Plan, Felicity’s Plan. On her birthday, a guinea postal order arrived from her godmother and a Scottish five pound note from her father. She put the money in her savings bank book. Added to the existing balance of two shillings and nine-pence, this gave her six pounds, three shillings and nine-pence toward The Plan. Something else happened. Brendan Webb, who was courting Felicity, began to work on that boat in his spare time: the Doram, owned by the jeweller. Felicity walked up to Sandsend to watch and to help a bit when it came to painting. It was a fine boat, bigger than most of the fishermen’s cobles and it had an engine as well as sails. I’m looking forward to visiting the Whitby Bookshop on Friday 7 October at 5 pm, to introduce the book and say thank you to the people who talked to me about their much-loved town.